Today the LG has officially released their latest Android 8.0 Oreo flagship G7 ThinQ in an event in new york, although we had some specifications and design of this mobile before this event but there some other hidden inspiring features to communicates to LG tech lovers, these features makes this device outstanding from all other LG mobile. The LG G7 ThinQ is said to come with a dedicated hardware button for Google Assistant and Google Lens. And then we see more additional photos of the device revealing LG G7 ThinQ’s colour variants. The LG ThinQ will be very nice device comparing this amazing features : Google Assistant, which is a commercial feature used by many, Google Lens which is still in its preview stage. For record purposes and those who don’t really about Google lens, Google Lens uses the camera to detect any objects in front of it, and offer suggestions accordingly. 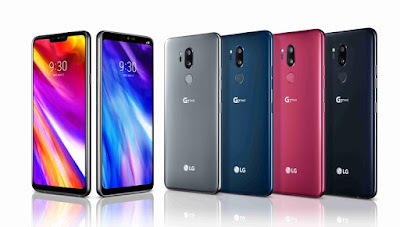 The release, states the “official” specifications of the LG G7 ThinQ, saying that the device runs an Android 8.0 Oreo based smartphone sports a 6.1-inch QHD+ (1440×3120 pixels) FullVision Super Bright Display with a 19.5:9 aspect ratio. It is powered by a Qualcomm Snapdragon 845 SoC. Memory: 4GB (G7) or 6GB of RAM (G7+). LG G7 ThinQ , Comes with two 16-megapixel rear cameras, with one bearing a 107-degree wide-angle lens and an f/1.9 aperture, and the other featuring an f/1.6 aperture and a 71-degree lens. On the front, it sports an 8-megapixel camera with an f/1.9 aperture. The report states it has two storage variants – 64GB (G7) and 128GB (G7+). It is also said to be IP68-certified for dust and water resistance. The LG G7 ThinQ is available in New Platinum Gray, New Aurora Black, New Moroccan Blue, or Raspberry Rose colour variants, and be powered by a 3000mAh battery. Dimension: 153.2×71.9×7.9mm, and weight is equivalent to 162 grams.